Please browse through genuine customer casestudies at the beginning of the list and testimonials which are below them. Heat Recovery Heat Pump Ventilation & Hot Water Case Study for three thermally efficient zero carbon homes at Waldegrave Estate, Chewton Mendip. Please click here to enter pdf document. Heat Recovery Heat Pump Ventilation & Hot Water Case Study for a recently Passivhaus Certified Social Housing project in Ditchingham and a runner-up in a Passivhaus Trust Award. Please click here to enter pdf document. 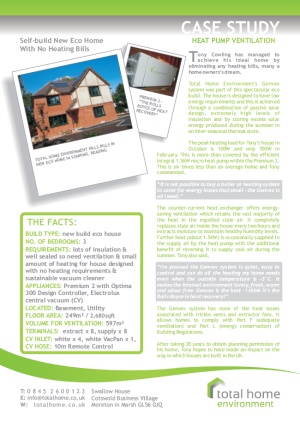 Heat Recovery Heat Pump Ventilation & Hot Water Case Study for a self-build new eco home with no heating bills. Please click here to enter pdf document. Heat Recovery Heat Pump Ventilation & Hot Water Case Study for a housing project in London of 77 Code Level 4 flats. Please click here to enter pdf document. Heat Recovery Ventilation Case Study for the first Passivhaus Standard Social Flats in the UK. 3 houses were so well insulated they didn't need a heating system thanks to Total Home Environment. Please click here to enter pdf document. 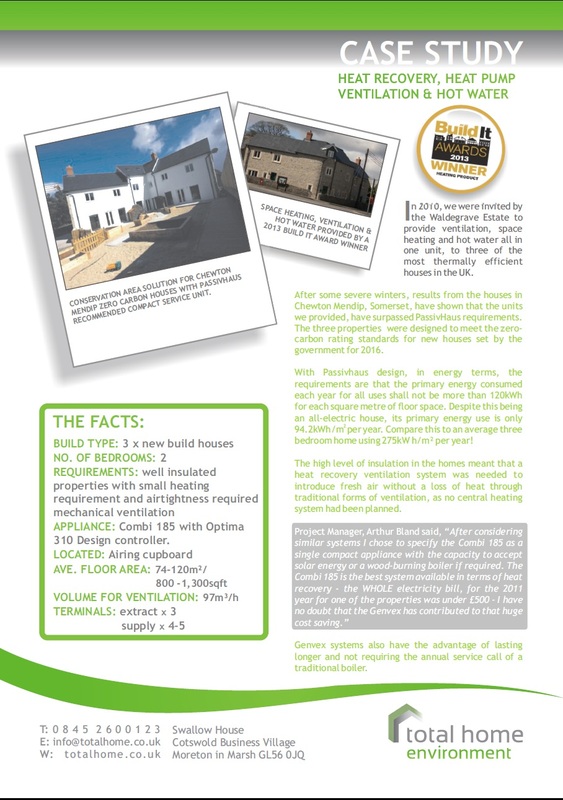 Heat Recovery Heat Pump Ventilation Case Study for a Zero Carbon self-build in 2003 and still going strong, thanks to Total Home Environment! Please click here to enter pdf document. Heat Recovery Ventilation Case Study for Sustainable Timber Frame Ltd in their client's 6,000sqft nuclear bunker conversion/extension.Please click here to enter pdf document. "We are so pleased with the system - the cooling in Summer was such a great investment - esp as powered by the solar panels..."
"... system is great and noise levels are very low. No doubt spiral rigid ducting is the way to go even though the initial workload may be slightly higher. The Zehnder unit has performed faultlessly... all in all a great service from you all." "Please pass on to Mr Colin Houseman our heart felt thanks for sorting out the noise glitches we had with our MVHR. He is a credit to your company." "Despite having animals and five members of the family living here, the MVHR system has given us a virtually dust-free home. An utter joy when it comes to cleaning!" "We are up and running! I have to say the house feels cooler tonight and the air fresh. I can only describe it as having had the windows open all day but without the draft, even tonight's cooking smell seemed to dispel really quickly, quite remarkable. I am delighted and really pleased... Lloyd was great... so do pass on my sincere thanks." "Thank you so much for all the trouble you have taken to support us in our drying-out process. We woke up this morning to find all our windows bone-dry, even though the outside temperature is only about 3°C! The internal humidity is now down to 43%... we can now turn our attention to redecorating to get rid of the black condensation marks on the wallpaper. We have been seriously impressed by everything we have seen of your company and just wish we could say the same of more people that have done work for us. We will let our neighbours and friends in France know how sucessful this system is proving and if we can do anything to help with recommendations elsewhere, just let us know." "I should have said we're really pleased with the performance of the system. The air always feels fresh and we've been through our first midge season in the new house and it's been great to be free of the little monsters inside." "Colin - just wanted to say thanks for your time last Friday - a helpful human voice is so much better than words on the page of an operating manual. We think the ventilation and heat recovery system has proved to be a great part of the benefits of our new build, so it's good to understand its range of options more fully." "Thanks to all for the support, I hope this was the most difficult project you have to deal with :), Mike was very very helpful, so thanks for the patience!" "Just a quick note to thank you and team on an efficient installation. Congratulations on the quality of your guys...excellent: efficient, polite and professional." "We wanted to thank Pete and his co-worker Paul on being exemplary installers. They have worked through some very cold weather in a totally unheated garage without a murmur. They have come in the snow braving the roads and 5h journey yet still worked an 8h day. Most of all, we hardly noticed having them here which was a real skill since our house is a bungalow and thus there is no place to hide. Our old heating and more so plumbing system have been quite complicated. I never heard Pete complain about the extra work this has entailed. While Pete and Paul were working I have had uninterrupted business meetings in the house. Pete has kept us informed of the progress every day. While staying locally their working day was regularly 10h or more. They have kept the place clean throughout. We have no hesitation to recommend Pete to any of your future clients". "Thank you for your patience and perseverance and for the splendid Instruction Card that will be carefully kept!" "I would like to add a personal note of thanks to Pete, who apart from being the most industrious contractor we have had on site, has also been polite and courteous throughout and has taken the time to explain and liaise with me on the positioning of the inlets and outlets of the system... A rare breed of 'thinker' - look after him; they are very rare..."
"Very impressive system designs. If other people we have dealt with, over this building process were half as amenable and half as efficient as you, we would have had such a smooth and quick process." "I would like to thank you for the engineer who serviced my Genvex system and my Electrolux vacuum system. He was polite, very knowledgeble and very helpful. Thank you and congratulations on employing such an excellent engineer"
"I have had a Genvex 525VPC heat pump ventilation system for a couple of years - it's awesome." "I'm absolutely delighted with the Combi 185 EC. It keeps my house fresh and warm with lots of hot water. The electricity associated with the heating and hot water is about £6/month!" "Thanks very much for the work involved with supply and installation of our heat recovery unit... We have been running the HR unit... and it is easily providing enough heat for the whole building without using the ground floor UFH system. The experience has proved to be one of the most straightforward and least stressful elements of our new build..."
"Re: Genvex Combi 185...it's clearly the best system I've found after a LOT of research..."
"... it has solved our condensation problems - it's had a good test this winter and there has been no condensation, which is a really good improvement as far as we're concerned... We now feel we can clean up and redecorate around the windows to get rid of the old mould/condensation marks. ... It doesn't take a lot of energy (& our electricity is from Good Energy) and it's lovely not having insects coming into the house!" "In a dental practice, health and safety, as well as cross infection control are paramount...We also need to consume high amounts of fresh water and energy. Being aware of this, we invested into modern technology in order to run our practice as eco friendly as possible: ...We also have a sophisticated ventilation system which produces clean and pollen free air... and the latest heat recovery system (Genvex)..."
“My original brief was to find something that could not only meet all my heating needs, but also the ventilation requirements for my home. However, at that time there was no such system available, so I decided on the Genvex 315VP for ventilation and to use it in conjunction with under-floor heating. It was expected that the heat pump ventilation system would assist the under-floor heating, but apart from early to mid morning between November and February, it supplies the majority of our heating needs. I also hoped that a good quality ventilation system would assist with my stepson’s asthma condition - the Genvex was successful and the asthma was cured almost completely! “...in 2003 we installed a Genvex 390 heat recovery ventilator unit in our five star self-catering property (www.suffolk-cowshed.co.uk). The building is approximately 120sqm (1,290sqft) and on one leve. Special attention was give to insulation of the building... We did install two Genvex pre-heater batteries; one for the living room/kitchen area and the other for the bedrooms and bathroom area. To supplement these we also installed two Nobo 1kW convector heaters. Overall we can keep the temperature up to 22°C in the coldest weather. We have many compliments about how comforatable the property is to live in. As we are in the Suffolk countryside, the pollen filter is of great help to guests who suffer from hay-fever and similar afflictions. Generally the air quality in the property is very good..."
At present few potential purchasers take into account the reduced heating fuel consumption afforded by the heat recovery unit but I believe that this will become a sales feature in the coming years as fuel prices increase. In my own private house we have noticed a considerable reduction in heating oil use; I estimate a 40% reduction over the winter months and a much improved interior climate which has considerably helped my asthmatic son. I would also like to comment on the efficiency and neatness of the work done by your installation team...the house was left clean and as undisturbed as possible..."